Chipotle Mexican Grill is having an incredibly hard time in the market at the moment. Months ago, CMG started to deal with claims of E.Coli. 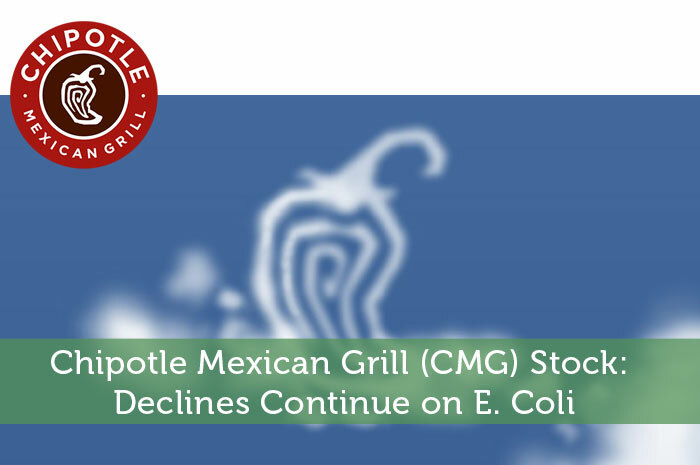 Now, things are getting worse as a more cases of E. Coli continue to hit CMG. Today, we’ll talk about the issues Chipotle has been facing, the new cases that have come about, what we’re seeing in the market as a result and what we can expect to see moving forward. Chipotle Mexican Grill has been hit by a barrage of bad news. All of the bad news surrounds a breakout of E. Coli that started earlier this year. In early November, Chipotle customers started to fall ill. More and more people started to be hospitalized with a rare DNA fingerprint of toxin-producing E. Coli. All of these people had eaten at Chipotle shortly before falling ill with the life-threatening condition. In fact, at the last report, we heard that 52 CMG customers through 9 states have become ill with E.Coli after eating food from Chipotle Mexican Grill. Over the past month, we have seen exponential declines in the value of CMG, and for good reason. The bottom line is that when a restaurant has a history of making consumers sick, less and less consumers are going to be willing to eat at that restaurant. As we continue to see cases of E. Coli as the result of eating at Chipotle, we can expect to see more and more declines in sales, and for that matter, the price of CMG stock. As a result of the issue, CMG is currently (12:05) trading at $499.66 per share after a loss of 4.23% so far today. Moving forward, I’m not expecting to see much by way of positivity from CMG any time soon. The reality is that as more and more cases of E. Coli pop up and are linked to eating at Chipotle, less and less consumers are going to be willing to take the risk. This is going to lead to a massive decline in sales, which equates to less by way of revenue and earnings. Even after CMG gets a hold of what’s going on and stops the outbreak, it’s going to stay fresh in the minds of consumers for a while. Ultimately, CMG will survive this issue, but not before dealing with long term declines in their stock. Where do you think CMG is headed moving forward? Let us know your opinion in the comments below!